Always I have tried to see this problem from a very generic standpoint (just three parts). And, separating it in three parts, data part, service part and client part, make it easy to explain and catch. So, I will refer to this picture to explain what are technologies I used through years to build a robust SOA application. As it’s known every application needs a persistent data storage. In this part to make a selection depends in scenario, but first you have to decide in concept level, do you need a structured data store or a non-structured one. In first part immediately take place (famous) RDBMS, with a lot of choices like SQL Server, Oracle or MySQL, or many others. And in second part you have two choices, a file approach (XML, or other type) or a kind-of-db approach, non-structured databases (or NO-SQL). In service part, I used to work with different technologies, and I was happy with them, almost happy :). But today it’s a kind of more approach and “developer-culture” what are you going to use, a SOAP approach or REST approach (that’s make you look cool). 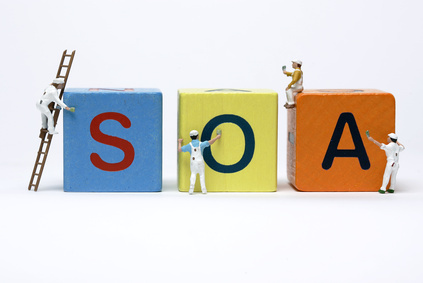 If you need / choose SOAP approach Windows Communication Foundation has it’s dedicated throne, it’s simply near-to-perfect solution (without configuration part :(, that’s more tricky than hard). And in REST part (that’s TBH I’m preferring and using a lot lately) I prefer two very “fancy” and robust technologies like ASP.Net Web API and ServiceStack.Net. Both of them are easy to start and offer complete functionality list to expose a good REST service. Huh, this is a hot part. Tons of choices. First of first, depends on your scenario (hah, I like this approach, do all the post just using “depends on your scenario” 🙂 ), if you need a desktop application, web one or mobile. In Windows desktop app you have two very mature technologies like Windows Forms and Windows Presentation Foundation. I like both, but I prefer more WPF because of it’s declarative user interface technology – XAML. In web part you have two “hard-competitors” ASP.Net and PHP. Now it’s visible that .Net fans always think for ASP.Net and others PHP. In my eyes I see them in pretty same position with a decision indicated by hosting environment. And of course if you need to touch planet you have to think for mobile and again, depends on you scenario you can develop your app for Windows Phone, Android or iOS. All shines on something, user base, money or fanciness or all :). And, last but not least, something is very clear, Service Oriented Applications are need, style and hot topic nowadays, because of many factors like portability, security, scale-ability, reach-ability and *ability, and you as developer have to master it. Or, your ideas are cloud!? An experienced SOA and Mobile software architect with a decade experience in building small-to-medium and large systems for public and private sector. This entry was posted in Development, Programming, SOA, Technology and tagged .net, asp.net, betim drenica, C#, microsoft, no sql, php, programming, service stack, sql server, technology, web api, Windows Forms, wpf. Bookmark the permalink. Reblogged this on Albanian .Net User Group. Betim te uroj per punen qe keni bere, eshte kenaqesi te shoh se edhe vendi dhe populli im hec me hapa te shpejte ne tech perpara. Nese rastesisht ju qet puna ne Belgjike kisha pase deshire te takohemi, pasi qe edhe une i takoi te njejtit profil.